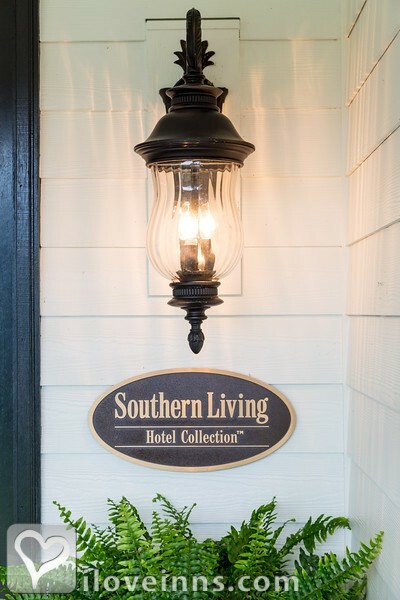 Casual elegance combined with Southern hospitality is one reason the B&B on Tiffany Hill is the 1st B&B of the Southern Living Hotel Collection. This purpose-built inn is situated on six gorgeous acres. The 7 suites feature a d�cor that reflects the southern towns they are named after. 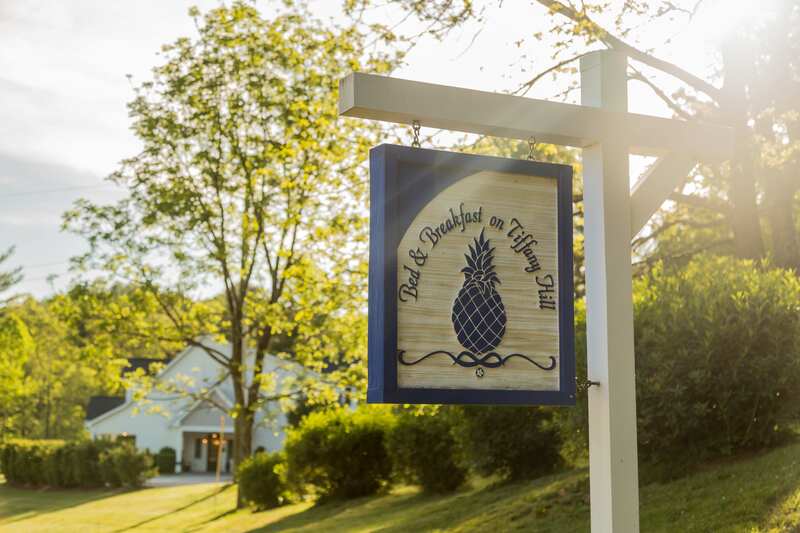 Bed & Breakfast on Tiffany Hill in Mills River boasts upscale amenities and comfort for business or leisure. A 24-hour complimentary guest pantry provides snacks and beverages. Conveniently located in the foothills of Western North Carolina, it is easy to explore the waterfalls of the DuPont State Recreational Forest, hike the Pisgah National Forest, tour along the Blue Ridge Parkway and visit the popular Biltmore Estate. The innkeepers will gladly assist with trip planning. Payment Types Accepted Include Master Card, Visa, Discover, Travelers Checks, American Express and Personal Checks. This property has 7 total guest accommodations, 7 with hot tubs, 7 suites, 1 cottage, 2 guest houses and 2 conference rooms. The types of beds available include Queen and King. Crossroads of calm in the middle of Western NC where you can do as much or as little as you like. Six acres of property offers several garden vinyettes. From a Circle of Trees with Adoranacks to the Herb Garden, Birdwatching Pavillion and the Secret Garden. Rest at the shore in this suite named after Seaside, Florida. Our downstairs suite has a King size bed and a six-foot walk in shower. Suite can accommodate one additional guest in twin fold out bed. ADA accessible. Inspired by the charm of Charlottesville, Virginia this large upstairs suite would be a dream come true for your honeymoon, anniversary or to spend time at your very own fireplace. From the King size room, French doors open into a large private bath area with soaking tub & separate shower. Old world French flair is reflected in this upstairs guest suite named after Natchez, Mississippi. Queen size poster bed, incredible window seat overlooking horse pastures, this room includes a large soaking tub with shower to aid your relaxation. 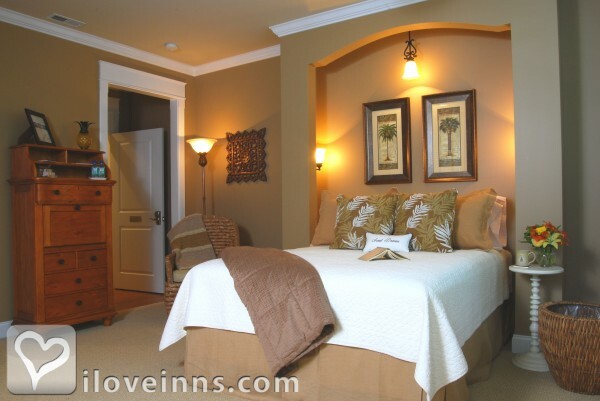 Low country flavor of Beaufort, South Carolina will melt away your cares as you rest in this upstairs Queen suite; designed to accommodate two additional guests in twin fold out window seat beds. Large bath area with double sinks and a separate tub/shower area. Straight from a picture book of Lexington, Kentucky. Reminiscent of an old world, horse country estate home with hardwood floors, wood beamed ceilings, and a large double fireplace. One of two adjoining suites in our stand-alone carriage house, this oversized suite also includes a wet bar area complete with refrigerator, microwave, and beverage service with an option of in-suite dining. Gorgeous garden views and beautiful mountain vistas are a breath of fresh air in this southern-styled queen suite from the heart of Alabama. This is one of two adjoining suites in our stand-alone carriage house. Included in your relaxing suite is a separate sitting area with a twin pullout sofa bed, wet bar area complete with refrigerator, microwave, and beverage service with an option of in-suite dining and private outdoor deck. A reservation is not considered confirmed until a deposit has been received. One-night deposit required with all reservations. Deposits will be refunded if notice of cancellation is received at least 14 days prior to the arrival date. Thereafter, deposits will be refunded less a $25 processing fee if the room is re-booked. The dates this property will honor the certificate are Monday-Thursday in January, March or August (Excludes Carriage House Suites). Breakfast at Tiffany Hill: Experience the Dream Cookbook features this Southern Bread Pudding Desert we serve as part of our three course breakfast. Enjoyed a wonderful reunion gathering at Tiffany Hill. Much attention was given to details from the furnishings to the food. This B&B is perfect for any occasion you may be celebrating. Selena treats each day as a celebration and makes sure her guests can appreciate the time they are spending at her B&B. Excellent food, beautiful rooms, lovely surroundings and a feeling that your every wish is being taken care of. I stayed there with a group of college friends and we did not want to leave! We felt at home from the moment we arrived until Selena waved us off as we headed home. I will be back. What a fabulous B&B! The thing that makes it so unusual it that is is brand new and built to be a B&B from the ground up. The entire Inn has been built and furnished to care for one's every need. It is extremely comfortable and cozy! The views from the Inn are spectacular and the peace and quiet adds to the ambiance. 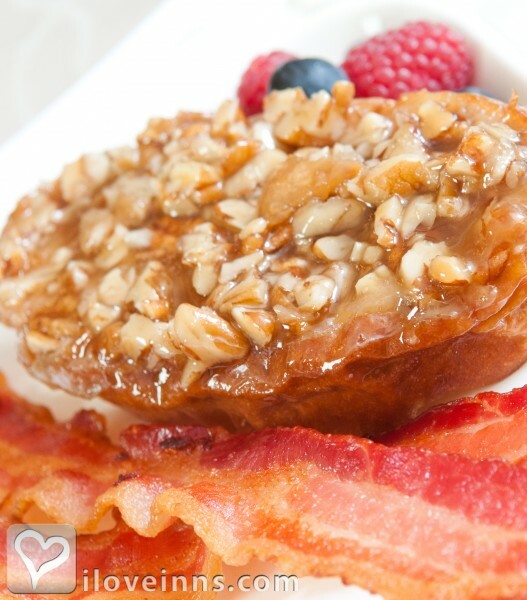 The three course breakfasts are wonderfully appetizing! Snacks and drinks in the afternoon are equally delicious. If you are going to be in the Asheville area, don't miss staying at Tiffany Hill! While the holiday season can be a time of hustle and bustle, frantic scheduling, shopping, and of course giving (sometimes too much of yourself) my fianc� and I found the perfect yuletide romantic retreat to pave the way a much needed reconnection. The Charlottesville suite has the romance inducing combination of fireplace, extravagant bathroom (huge soaking tub), and gorgeous decor with a four poster king size bed and sweeping views of the property. Selena was absolute genius with outing suggestions as well quiet thoughtfulness for our downtime. We no doubt, were able to refocus on our commitment to each other, all the while a lot more joyous to our family due to romantic holiday home away from home. Thank you Selena! This is the perfect romantic getaway! This was designed to be a romantic bed and breakfast as a forethought, not an afterthought. Selena, the innkeeper, has thought of every little detail and treats everyone as royalty! It has classy, beautiful rooms, with both a beautiful front and back porch. There are so many private places for a couple to sneak away in her beautiful gardens. This B & B is centrally located to so many things - great restaurants for dinner, the Biltmore, Flat Rock Playhouse, hiking, etc. I've stayed here twice, and each time I'm wishing for just one more day. From the moment my husband and I stepped onto this beautiful property, we knew we would enjoy our stay at B & B on Tiffany Hill. We stayed in the Charlottesville Suite with was spacious, appointed with lovely furniture, fabrics, fireplace AND a gorgeous private bathroom. Selena Einwechter, the innkeeper, was amazing. Delicious breakfasts, afternoon wine/appetizers, breathtaking view of the mountains from a large and elegant front porch all made for a perfect romantic stay for my husband and me. My husband and I spent our 40th Anniversary weekend at Tiffany Hill. The location was perfect, inn was beautiful, and the food was simply delicious. The hospitality Selena showed us could not have made our weekend any more special. My husband picked the perfect Bed & Breakfast!!!! From the moment, my wife and I entered Tiffany Hill, we knew we had found our new favorite place. Everything felt right. The decor was warm and romantic. Our room was perfect in every detail. Selena, the owner, spoiled us every moment of our stay. From her greeting as we entered the property, to her wave goodbye from the front porch as we left for home, we knew we were in the presence of a very special person. We enjoyed walks on the intimate trails, a glass of wine on the front porch rockers, a candlelit breakfast with an amazing dessert (there's always time for homemade dessert at Tiffany's). Visit Tiffany's. You'll be glad you did. Tiffany Hill causes love to excel. My Fiance at the time planned a Suprise honeymoon for Us this past summer! After our wedding we pulled up to the most amazing "home" ever! We were greated by the wonderful inn keeper Selena! The place just felt like a home away from home when we walked through the door! Our room was amazing and the breakfast was to die for!! Selena took care of our dinner reservations and we were even given a yummy dessert at the resturant for free! The second day we were there we had a wonderful picnic packed for our waterfall/ Hiking trip with so many thoughtful things packed! She had thought of everything to make our honeymoon even that more special! We live in Asheville, but it felt like we were so far from home!! This was the First B&B I have ever stayed at, and Will deffinatly be the only one! B&B on Tiffany Hill is just Beautiful and Amazing! We have our next stay planned and I am just soo excited! My husband and I visited the B&B in October to celebrate an anniversary and were blown away with this place. It is like no other B&B you've ever visited - it is modern, bright, fabulously furnished and a great escape from the world. The rooms are all gorgeous. The innkeeper has thought of every detail. As an example, a friend had ordered a bottle of champagne for us. It was delivered to our room on a beautiful tray with glasses. The next day we found the cork with a quarter stuck in it along with a nice note from the innkeeper. The note explained that a coin in a cork is supposed to bring prosperity. It made a nice memento for us of our trip there. You won't want to miss breakfast. They were fabulous. We were lucky enough to be there for a candlelit breakfast one morning. It really was memorable. I know we'll be back soon. Gents, If you're looking for that PERFECT place for the perfect getaway, this is it! We loved everything about Tiffany Hill - the location, atmosphere, amenities, food, and especially the innkeeper, Selena...she is now a life-long friend. She really makes you feel welcome and at home. She goes through great endeavors to ensure your stay is something you'll both remember for the rest of your lives. Tiffany Hill isn't your typical BnB. Tiffany Hill is brand new - and was designed as a BnB. In fact, there's more than 25 years worth of planning and dreaming to make Tiffany Hill a reality. As soon as you walk in - you see it, and feel it. I can say, without hesitation, that we will be back. If you're looking for a romantic getaway, be sure to visit Bed & Breakfast on Tiffany Hill in Mills River, NC. This is the most beautiful inn my husband and I have ever stayed in. Selena has hiking trails, and a great place to birdwatch or have a romantic picnic. You can explore all the beautiful sights around Asheville and Hendersonville, and plenty of great places to shop. She serves the most delicious breakfasts you'll ever eat too! Be sure to check it out. You won't be disappointed!! 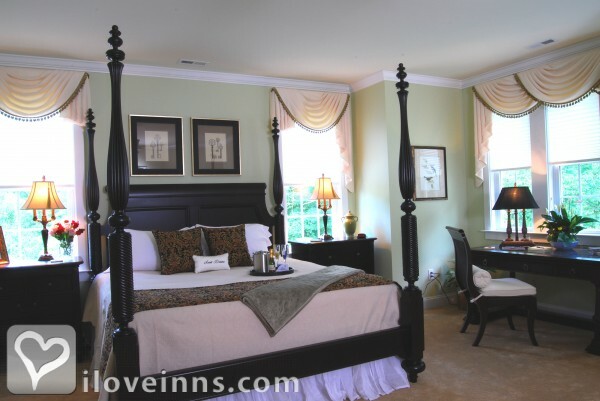 My husband and I chose the Inn on Tiffany Hill based upon numerous recommendations. This was my Christmas gift -- a bed/breakfast + a candlelight tour of the Biltmore. It was everything we wanted..............and more. Our description would be beautiful, relaxing and comfortable. Selena, the Innkeeper, is a very special person. She truly makes you feel as if you are her most important guest and that your wants/needs have already been anticipated and taken care of. The accommodations are beautiful yet comfortable and the food is amazing. Selena takes a personal interest in her guests and offers recommendations of activities, dining, etc. based on her personal experience. We loved our stay and plan to return often! The last morning of our stay we awoke to a snow covered wonderland that was right out of a Normal Rockwell painting. What more could you ask for? We love to go to the Bed & Breakfast on Tiffany Hill! It is a very romantic getaway and our favorite! The peace and tranquility of the property is very relaxing. Yet there is plenty to do nearby with major attractions, waterfalls and other outdoor activities. Whether an anniversary, birthday, special day or ordinary day, Tiffany Hill is an excellent romantic way to spend your days! Romantic Inn of North Carolina!! This is the most romantic inn that we have ever stayed at. The "Norman Rockwell" view of the red barn across the street is only topped by the view of the "human birdhouse" out back. Selena does everything she can to make this the most enjoyable experience that a couple could have. This is on our top visits of all time....only second to the visit to the coast of Italy! Thanks for such a great time....make sure that you take the time to stay in the Charlottesville room so you can enjoy the awesome personal fireplace with your loved one. Not in my wildest imagination could I have known what a wonderful weekend we would have at Tiffany on the Hill. We felt like royalty from the moment we entered the front door until we left 4 days later. After 35 yrs of marriage and hosting a reunion of old friends; we have new memories of a wonderful gathering in a beautiful setting. Every detail was exceptional; luxurious towels, soaps and bathrobes, delicious extravagant breakfasts,luxurious linens and fabulous furnishings, maps to local restaurants and surroundings. I needed one more day to shop; the first ones kept my head spinning in all the beauty of Fall at it's best. Tiffany on the Hill is gorgeous and so peaceful and accommodating. Selena is top notch hostess to make you feel at home. This was our third visit to Tiffany Hill and once again it was exceptional! This B&B is fabulous in every way! The Innkeeper, Selena, is excellent in taking care of even the smallest detail. We have future reservations on the books and look forward to returning again and again! We highly recommend it! Selena (the Inn Keeper) got every single detail right. We couldn't have asked for anything more! I have a hard time figuring out where to start... She takes everything into consideration. Let me begin with the daily four course breakfast. What an amazing cook!!! If you have a dietary restrictions, let her know and she will taylor your meal for you. Every room is climate controlled and has it's own volume control for the relaxing music that plays through out the house all day. The house is immaculate; not a speck of dust anywhere. The design is flawless. It's got posh, luxurious, high class comfort. You will feel as comfortable there as you would your own home (just more pampered). There are many beautiful sitting areas to choose from and three gardens to walk through. There is never a shortage of things to do at Tiffany Hill, but it's nice to know that it's in close proximity ro Asheville and Hendersonville. Our wedding weekend was fabulous! My bridesmaids and I stayed on a Friday night and prepared for the wedding Saturday afternoon. Any last minute things that we needed, Selena was sure to provide. When my new husband and I arrived Saturday night, there was a bottle of champagne with two glasses for us to enjoy next to the fireplace. It was a dream come true! We fully intend to spend our one year anniversary back at Tiffany Hill. Selena's guests comfort is her number one priority and it shows in every aspect of your stay. I would HIGHLY suggest the Bed and Breakfast on Tiffany Hill to anyone who wants to relax in one of the most beautiful environments imaginable! Five stars aren't enough! This bed and breakfast was very romantic. It was the pefect place to spend the first days of my marriage to my beautiful wife, i could not have found a better place to start a marriage out on the right foot. Selena made us feel like a king and queen from chocolate covered strawberries to candle lit french toast breakfast. I will recommend this slice of paradise to all our family and friends. My wife and I have stayed at Tiffany Hill on a couple of different occasions. Each time has been wonderful. We had wonderfully romantic week at Tiffany Hill last winter we were actually snowed in for a couple of days. We look forward to our next visit. We were married in April and spent our honeymoon at the B&B on Tiffany Hill. We stayed in the Charlottesville room, which had a soaking tub with wonderful bath salts and lotions. The room has a fireplace, piped in soothing music, a beautiful view of the friendship garden and tree lined landscape. The evenings we spent moon gazing with hot chocolate bundled up on the front porch. The meals were fantastic; Selena went to great lengths to ensure that all food allergies were accomodated during our stay. The inn was an incredible beginning to our marriage, and an experience we share with others. We look forward to our next visit to the B & B on Tiffany Hill. Most Romantic Inn We've Visited! Hands down, the Bed and Breakfast on Tiffany Hill is the epitome of a romantic getaway. My husband and I stayed there for our honeymoon, and we could not be more happy with our time there. Tiffany Hill exudes classic romance: no gaudy cupids and arrows; rather, cozy fireplaces, sunlit walking trails in the woods, gourmet meals, and quiet places to just enjoy being together. In addition to its breathtaking scenery in mountains near Asheville, Tiffany Hill's Innkeeper Selena is a treasure. The quintessential gracious hostess, her hospitality met us at the door and will bring us back again and again (as if her fantastic cooking wasn't enough!). We're thrilled that we got to enjoy such a special time in our life at such a remarkable and romantic place. Our treasured memories from there are priceless! My husband and I stayed on Tiffany Hill last summer and can not wait to go back in October. The room was fabulous, we stay in the Charlottesville. From the fireplace, beautiful bed and big bathroom down to the piped in music, chocolates, champagne & bathrobes; it just doesn't get any more romantic than that. The breakfasts were wonderful and the grounds are lovely. Selena has created a wonderful spot for relaxing, romance and rejuvenation. My wife and I stayed here on our way through Asheville NC. The room was wonderful and the bed was soooo comfortable. Breakfast was great along with the hospitality. We'll return again real soon. Bed and Breakfast on Tiffany Hill is our "special place." It is wonderfully romantic. The inn is absolutely lovely, the property is amazingly beautiful, the area is divine. Selena, the inn keeper, is the perfect host. Simply put...it is splendid. My husband and I look forward to many returns. 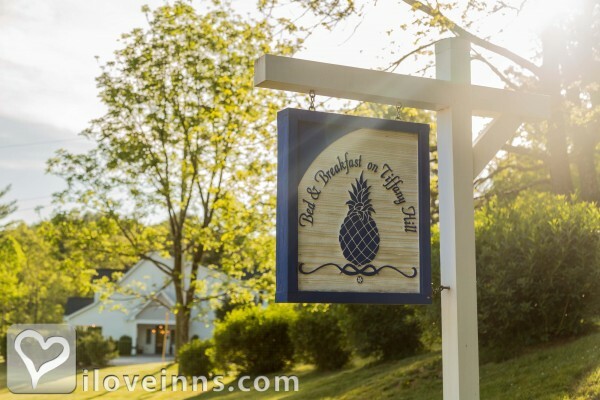 My husband and I are great fans of bed and breakfast and last August my husband surprise me with a visit to Bed and Breakfast on Tiffany Hill! The Inn was newly opend and absolutely fantastic. Because I had just had surgery, we stayed in the Seaside Suite which is located on the first floor and handicap friendly. Selena had taken care of all details...making our anniversary get-away so memorable. We have stayed at many bed and breakfasts over the years and Bed and Breakfast on Tiffany Hill is by far the best yet! 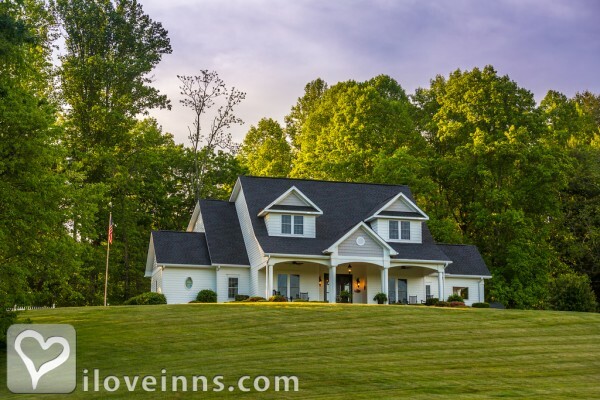 The B&B on Tiffany Hill is the perfect destination for a romantic NC mountains getaway. 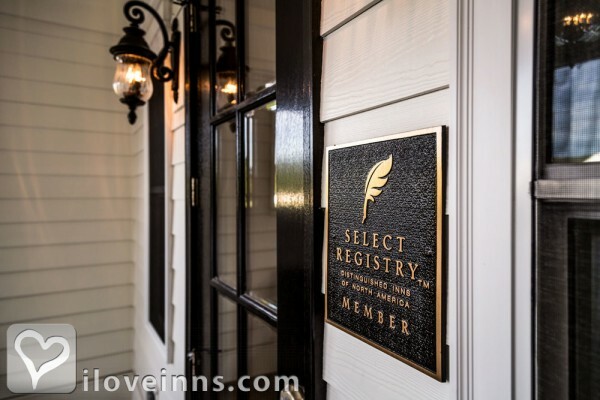 My husband and I visited Tiffany Hill last Fall for our "Babymoon" (last hooray before our baby was born)staying in the Charlottesville suite and had a wonderful time. So much so that when it came time to plan our wedding anniversary celebration we both immediately thought of another trip to Tiffany Hill - can't wait until October! You will love your stay at the Bed & Breakfast on Tiffany Hill. The innkeeper Selena will ensure that your stay is a one of a kind experience. The rooms are immaculate and comfortable. Breakfast is absolutely delicious you will not want to leave. The grounds are peaceful and relaxing and Ray Hill Road is one of the most beautiful drives in the area. My sister gave me a gift certificate for the inn and I was reluctant to go, but I had the best time. I have been back several times and will continue to visit. I stay in the Seaside Suite and love it. The shower is awesome. 6 foot walk-in shower. The inn is beautiful and peaceful. Selena, the inn keeper, is the bomb. She is very hospitable and breakfast at Tiffany's is great. You have to have the stuffed french toast and pineapple upside down cake. You will be very pleased. This Inn is awesome! My husband and I have been staying at B & B's through the US and Europe. This by far is one of the best. Clean, beautiful, great service. We'll go back again and again! The Bed & Breakfast on Tiffany Hill does everything right! If you are looking for a romantic getaway this is the place to go. From the elegantly appointed suites to the beautiful gardens to the gourmet breakfast Tiffany Hill makes your stay memorable. After visiting the local points of interest you can relax in your room in front of your fireplace or in your jacuzzi tub or enjoy a glass of wine on the front porch. Whatever your pleasure the Bed & Breakfast on Tiffany Hill is the place to go. My husband and I spent our ninth anniversary weekend at Tiffany Hill. What a beautiful property! We felt truly pampered. Selena is a wonderful southern host. We could not have been more pleased with our stay at Tiffany Hill. We especially appreciated the excellent advice on a restaurant for Friday night and when we returned (as planned ahead), the Innkeeper had wine, a red rose, and chocolate covered strawberries waiting for us so we could sit under the stars and enjoy the night and each other in the gentle, cool, breeze on the lawn. Could not have been a more perfect 38th anniversary for us! We heard about Tiffany Hill from friends who invited us for a weekend. Turns out our 25th Anniversary was the same weekend. We weren't really sure if the Bed and Breakfast at Tiffany Hill would be special enough to celebrate such an important occasion. All our concerns were immediately dismissed when we entered the front doors of Tiffany Hill. We stayed in the Charlottesville Suite which has romance in its very essence. From the intimate setting in front of the fireplace, to the relaxing and large whirpool tub, Innkeeper Selena Einwechter had our every desire met. We had only to step outside our door and had a personal beverage and snack station at our fingertips. Had it not been for the amazing gourmet breakfast offered in the mornings, we may never have left our suite. Selena's heart was poured into every aspect of our stay, and her dream has now become our favorite destination. No need for my husband to find that perfect gift for our next anniversary, just take me back to Tiffany Hill! Innkeeper Selena Einwechter has all the information on what to see and do in the area. Rely on her expertise when planning entertainment, dinner reservations, and recreational outings. If a more relaxed stay is what you need then the Inn beckons you to enjoy the several gardens (including the Human Birdhouse), snooze in the hammock, or grab the had of your sweetie and stroll on the Celebration Walk. The Bed and Breakfast at Tiffany Hill is within a 20 minute drive to the front gate of the Biltmore House, making it your best choice for staying close but out of the crowds. This is an absolutely gorgeous place! The innkeeper thinks of everything. Top-notch! The B&B on Tiffany Hill is wonderful! 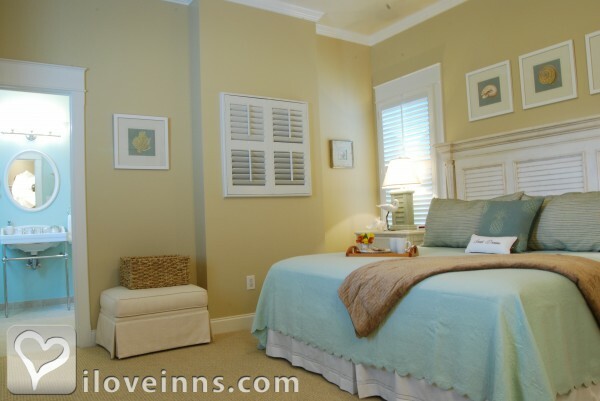 It's a 5 suite property - each named after the owner's favorite Southern towns. Attention to detail and all the comforts of home are included - fluffy robes and towels; music in each room; a coffee maker outside the door; quality furnishings and linens; etc. There is a also a common living room for games, reading, or relaxing. A 3 course gourmet breakfast is served in the dining room or on the back porch. Afternoon snack and beverages provided. Lovely gardens to meander through, including a birdhouse gazebo. Extras such as champagne can be ordered if you are celebrating something special. The Inn is conducive to meeting others, or hiding away if you want privacy. And it's just a short drive to Asheville, Hendersonville, and the beauty of the Western Carolina mountains. Truly a place to return to! The new Bed & Breakfast at Tiffany Hill is a wonderful romantic getaway just outside of Asheville, NC. My husband and I recently spent time away there and were absolutely delighted! It is not only wonderfully decorated and incredible comfortable --- but we were treated like royalty by the Innkeeper. Our suite was large and spacious, elegantly appointed, complete with a wonderful fireplace and soaking tub. The Innkeeper will make up a picnic for you, and has her pulse on all that is going on in the region. She made great suggestions for wonderful dinners and unsual activities that helped us connect...like a painting class one day and then a hike to a waterfall the next. Plus, the Biltmore House/Gardens/Winery are just 20 minutes away (take the rooftop tour) which we enjoyed immensely. Brevard, Hendersonville, Chimney Rock and many other cute towns are nearby to the B&B on Tiffany Hill. Take in a production at the FlatRock Community Playhouse, visit Thomas Wolfe and Carl Sandberg's homes, see a white squirrel in Brevard or time your visit to see the Brevard School of Music perform when Keith Lockhart is directing. The beauty of the region, the elegance of the B&B on Tiffany Hill and the many offerings in this area make for a great romantic vacation. Tiffany Hill is the Total Package. Beautiful setting, Comfortably elegant, not Overly Girly (even the Guys' Guy will appreciate Tiffany Hill)... The perfect spot to romantically reconnect. Inside and out...stay on the property to take full advantage of all the ways Tiffany Hill can stoke the fires of your love! Honestly, this is the perfect place to remember how to hold hands again. This is by far one of the best B&B I have ever stayed in. Everything you could possibly think of for a romantic getaway has been taken care of for you. I personally love strolling through the secret gardens where benches are strategically placed, it's just beautiful and so peaceful-love it! 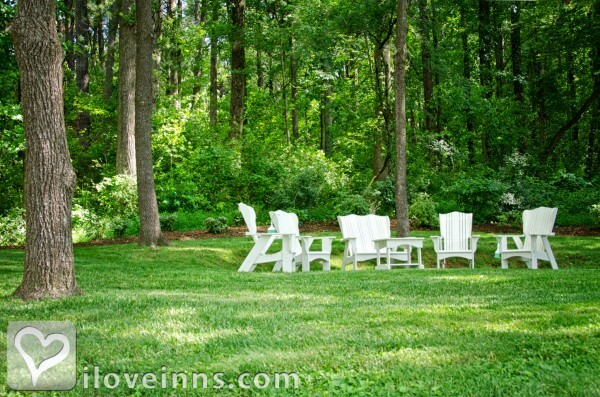 Take a picnic and stay awhile in the gardens - the Innkeeper will pack a picnic for you! Enjoy your stay! Visiting Bed & Breakfast on Tiffany Hill is like stepping into another world with no worries. The place is impeccably decorated and the atmosphere is of relaxed casual elegance. The setting, decor, service of Tiffany Hill is perfect for a get away, even for us over the hill guys!!!!! My husband and I stayed at this new, upscale inn for our anniversary. It was the most romantic, relaxing weekend we could've imagined. The innkeeper is very discreet, but always available, and kept around-the-clock, personalized snacks and beverages available. I highly recommend this inn, and I think it should be considered as one of the top 10 romantic inns. What a wonderful weekend my husband and I spent at Tiffany Hill! We had the chance to relax as soon as we entered, and do as little or as much as we wanted. We chose to take advantage of the perfect setting, and enjoy each other's company. We highly recommend this new and beautiful B&B. The hostess has thought of every detail! Perfect getaway for couples! Get to know each other all over again!! This is the perfect location for a mixed weekend of relaxing and activities. Be sure to spend one of your days hanging out together on the property .... it will bring back the romance of when you first met! Romantic with a capital R! If you are looking for an inn that provides a romantic setting for a special occasion or just a quiet weekend away - Bed & Breakfast on Tiffany Hill is a must! The Charlottesville suite is particularly romantic with a fireplace and whirlpool bath! Curl up next to your sweetheart in any of the other 4 suites and be whisked away to sweet dreams. The 3-course gourmet breakfast is beyond words! Make a point to check it out SOON! We chose the Bed & Breakfast on Tiffany Hill to celebrate my birthday. It was a lovely get away with every detail handled beautifully by the Innkeeper. The room was nicely decorated, fresh, clean and very comfortable...as is the entire B&B!! The gardens are enchanting and the lightening bug display from the front porch after dusk was extraordinary! Highly recommend Tiffany Hill for any celebration or get away!!! Great place to relax and be romantic!!! Make sure and utilize the knowledge of the Innkeeper, Selena Einwechter. She is fabulous at making recommendations and suggesting special highlights for any celebration or special get away! This is by far the most amazing bed & breakfast. Not only is it in a perfect location, but Selena (the owner) makes your stay one of a kind and you feel as though you've known her for years. It is the ideal romantic getaway and as soon as we walked in, we wanted to stay longer. We plan to return every year and think of it as "our happy place." If you don't stay here, you will truly be missing out on your dream B&B experience. Tiffany Hill is an AMAZING B&B located near Asheville, NC. It is such a wonderful getaway for ANY occasion but particularly caters to couples as an extrordinary romantic getaway for some much needed time together. Best B&B we've ever stayed in! Absolutely magnificent!! We spent our wedding weekend at the Bed and Breakfast on Tiffany Hill, and everything was beyond our wildest dreams. The setting is spectacular (we brought our photographers back with us to take pictures and they were in Heaven! Amazing pictures! ), but even more phenomenal was the hospitality: Selena, the Innkeeper, made us feel right at home from the moment we got there. She made a delicious super early morning breakfast for the bridal party on the day of the wedding and completely worked around our busy schedule. And the food!! Out-of-this-world good. The rooms are gorgeous: the fireplace, the gigantic claw-foot tub... pure romance. We could not be more happy with our stay at Tiffany Hill and are so glad we got to share our wedding weekend there! My husband and I have decided to spend our next anniversary at the Tiffany since our last anniversary visit was so wonderful. Selena ensures that you have a nice relaxing and enjoyable time while staying with her. The house is set away from the hustle and bustle of the city where you can just get away from it all. This is better than home because you can relax and let your worries go. The Innkeeper has thought of every detail with the traveler in mind. We felt right at home and we didn't have to request a thing - everything we needed was provided. Not only is the B&B beautiful, but it's relaxing, peaceful, and warm. The Innkeeper adds to this by her wonderful hospitality and fun. Did I say it's NEW? Tiffany Hill is extremely charming and beautiful and Selena made us feel so comfortable and totally taken care of. A very romantic retreat! Having "Breakfast at Tiffanys" was a true delight!! I recently stayed at Tiffany Hill with my two children (ages 16 & 11). I was very impressed how the Beaufort Suite accommodated me and my children comfortably. We had plenty of elbow-room and accoutrements to keep us completely satisfied. After two days of sight-seeing the beautiful Pisgah National Parks and DuPont State Forest, we found ourselves wanting to come back and just hang out at the B&B. The front porch is worth the price of addmission alone, yet there is so much more. My favorite part was meeting the different guests that stayed at the Hill... new friends and interesting stories add such charm to an already comfortable stay. The Bed and Breakfast on Tiffany Hill will have a special place in my heart. It is sure to bless other visitors and guests with a wide variety of Selena's southern comfort and hospitality! I Highly recommend! My husband and I stayed here on our wedding night. What a wonderful getaway?! The room was very clean. Selena must have thought of everything. She is extremely hospitable and will go above and beyond to make you feel like a guest in her own home. We were served a top-notch breakfast in bed the next morning. I would recommend this place to anyone that is looking for someting more than a hotel. It was absolutely perfect. My husband and I have traveled around the world and we have stayed in many luxury boutique hotels and Bed & Breakfast on Tiffany Hill is a secret gem in the mountains of North Carolina. We received the warmest welcome from Selena with a very special southern front greeting. We relaxed and read in the quiet countryside where all we could here were the birds. A perfect place to read, rest and nap. In the evening we sat on her beautiful big front porch in rocking chairs and watched the fire fly dance. Something everyone should experience in life. The Inn is brand new and the decor is elegant and cozy. The 3 course breakfast personally made and served by Selena was delicious! We can't wait to go back soon. This is going to be our home away from home where we can go to rest and recharge. Thank you Selena, we feel like we have a new friend in you! After seeing all the positive reviews, I was so anticipating my stay at Tiffany Hill!! It far exceeded all my expectations. The first impression was so positive, all the attention to detail was the standout for me. We can't wait to go back and stay longer. The grounds and inn are GORGEOUS!!!!! Hope to be back real soon. What a delightful B&B!! We spent our 27th wedding anniversary on Tiffany Hill and had an incredible time. Selena is magnificent. She is attentive to all of the details and ensures that her guests feel welcome and comfortable. The location is great; it's peaceful and quiet and an easy drive from so many wonderful places to visit. The day starts off with a gourmet breakfast (that includes dessert!). How you spend the rest of the day is limited only by your imagination. I strongly recommend Tiffany Hill and I'm looking forward to our next trip. Staying at Tiffany Hill was an amazing experience! There was so much to do locally but we couldn't wait to finish up our local plans so we could spend a day at the inn...it is a truly warm and inviting atmosphere. Our hostess, Selena, was so attentive and always a step ahead...her hospitality is pure perfection with her attention to every detail. She really makes it a home away from home, except BETTER!!! Thank you Selena!!! We can't wait to come back! My college roommate and I chose Bed & Breakfast on Tiffany Hill for our bi-annual catch up weekend. 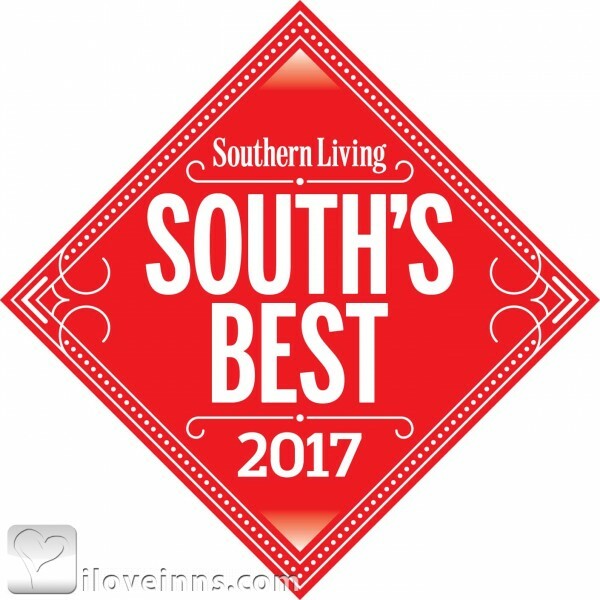 We knew the location of Tiffany Hill was excellent; easily accessible off of the main interstates and close to Asheville, Hendersonville, and Brevard. What we did not know was what an amazing treat awaited us at the Inn! Selena, the Innkeeper, has thought over every possible detail and anticipated every need. She is gracious, personable, and completely committed to her guests� comfort. We stayed in the Madison and Natchez suites. Both were beautiful, but not so fancy that you felt uncomfortable. The Inn is situated on several acres. 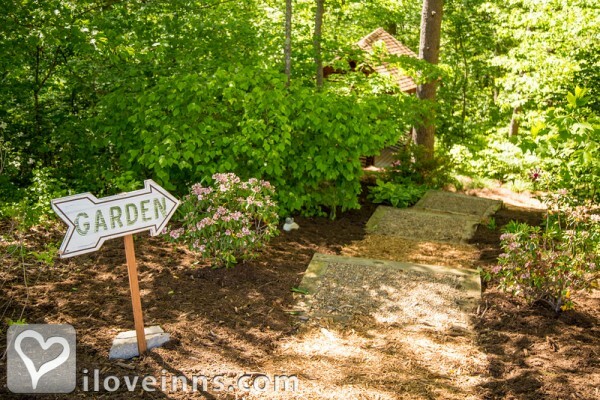 The property has many well-kept walking paths, and seven gardens! � all with great places to sit and visit. Our visit ended with a gourmet breakfast including herb-roasted potatoes made with herbs from one of Selena�s gardens. What a delightful escape in a great location. My husband and I just got married at Tiffany Hill a few weeks ago; we stayed there for 5 nights in the Charlottesville suite. The bed and breakfast was modern, private, in a great location, and had the BEST innkeeper! Selena is what makes the B&B so outstanding- we trusted her recommendations for every restaurant and outing. We were about 15 minutes away from some beautiful waterfalls, the Biltmore estate, and the city of Asheville. You can do anything you can imagine with very little of a drive. The property is gorgeous; especially in October when we were there with the fall colors. The rooms are very luxurious, especially the Charlottesville which has a jet tub, fireplace and a huge walk in shower with heat lights. It was PERFECT for our honeymoon. The rooms have keypad entries so we didn't have to worry about losing or grabbing our key before we left our room. I could go on for pages about the wonderful accommodations the B&B offers. We are going to return here again for a trip, and after staying here, I'm not sure I could ever stay in a hotel again! My parents are even planning a trip to the area to stay here just from our pictures! A gourmet three course breakfast every morning? AND the room rates are VERY REASONABLE for what you get!! !Could you ask for anything better? My husband and I stayed here for the first time November 2011 and were in awe of everything in this house. All the rooms were incredible, we stayed in the Charlottesville and it was incredibly romantic! The breakfasts were amazing and Selena, the owner, is so incredibly helpful/sweet/thoughtful, she really made you feel at home. This will definitely be our new yearly destination! In April 2011, we were looking for a place to stay to break up a drive from Nashville to Charleston and found the B&B on Tiffany Hill. We decided to stay there because of the great reviews and weren't disappointed. "Tiffany" and Selena, the innkeeper, exceeded our expectations. The inn was charming, beautifully decorated and spotless. Selena was gracious, extremely accommodating and made a wonderful breakfast. In fact, my husband uses a wheelchair and we were the first guest needing handicapped accessible accommodations. The Seaside room fit the bill, but did not have any kind of shower chair. Selena asked if there was anything she could do for us and we asked about the shower chair, which she did not have. As we were there for just one night, it wasn't a big deal, but when we returned from dinner, there was a shower chair waiting for us! She had run out to Home Depot and purchased one specifically for us to use (and, of course, for future guests with a similar situation). This is definitely service that goes above and beyond. Selena also gave us great dinner recommendations in a nearby town. Tiffany is a little off the beaten path if you're visiting Asheville, but definitely a 5 star getaway. What was originally just a �stopover� turned in to one of the highlights of our trip. We recently visited the Bed & Breakfast on Tiffany Hill and thoroughly enjoyed every aspect of our stay. We were married on the property and spent three nights in the Charlottesville Suite. I can not say enough complimentary things about the Inn or the Innkeeper, Selena. She was always a step ahead - thinking of things to make our stay perfect and memorable. We celebrated breakfast by candlelight with the other guests, had champagne waiting in our suite after we returned from dinner, my wedding dress was stored safely and then returned to our room while I was out at the salon, the list could go on and on. 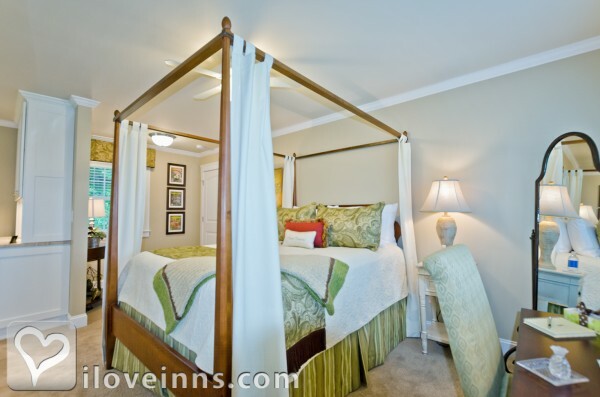 The Inn is spotlessly clean and well appointed, everything about our stay was perfect. We look forward to returning in the future. I have traveled all over the world, and can honestly say the B&B on Tiffany Hill tops any other Inn I have ever visited. Everything was AMAZING at Tiffany Hill - the room, the common areas, the decor, the food, the setting, and the service (Selena is awesome). All impeccable! I highly recommend to anyone wanting to get away. It also would be a great place to rent out the entire B&B with a big family or group of friends. My boyfriend and I stayed at the Bed & Breakfast on Tiffany Hill and had an excellent time. The innkeeper Selena was so gracious and kind. The entire property is absolutely beautiful and the rooms are perfect. Selena is extremely helpful in finding the perfect area attractions that will best fit you and the experience you are looking to have. Selena and her assistant Kate make a delicious three course breakfast each morning. I would recommend this bed and breakfast to individuals of all ages! Its perfect!! Tiffany Hill is the perfect spot for a break from reality. The gardens and grounds are absolutely gorgeous, while the home has all the comforts you could imagine. Each three course breakfast was pleasing both to the eyes and to the taste. Selena took special care of the little touches that pushed our stay over the top. God willing we hope to return and have our wedding on the beautiful Tiffany Hill. The greatest home away from home. My girlfriend and I have never been to a bed and breakfast before. I haven't had the chance and my girlfriend has never wanted to because she was always afraid it would be a bad experience. We travel at least once a year together and either get a hotel room or typically rent a house for a week. This was our first bed and breakfast. I say this with no exaggeration whatsoever: It was the BEST EXPERIENCE I've ever had at any location, EVER! It is definitely Southern Hospitality at its finest! Selena, the owner of this LOVELY little paradise, was the sweetest woman I have ever met. She was so caring and helpful, and always was bright with a brilliant energy that had to be from reaching some sort of Nirvana. Even when she was feeling a bit down from allergies, she wanted to be as helpful as she could possibly be. And I haven't begun to talk about the gourmet 3-course breakfast that is ready every morning at 8:30. She is an amazing cook and has some great recipes. She has a hash brown casserol that was incredibly delicious. She starts off the morning with a fruit appetizer for good health, then the main entree course. And as she told us every day, "At Tiffany Hill, we always leave room for dessert!" and we did. One day she brought out this AMAZING pineapple pudding that was delectable. One of the days she brought out for dessert some chocolate sundaes that all the ladies in the house loved to death. The amenities at Tiffany Hill are as great as there ever is to make you feel at home. The place is incredibly cozy and it's all updated with modern amenities such as individual temperature control for each room, keyless entry, soundproofed rooms, and wi-fi throughout the house. Each room has their own T.V. and individual bathroom for the most privacy. And the beds and sheets were a dream. After the day of exploring the area, I got into that bed, I was out and nothing except for Selena's gourmet cooking would get me out. If you are EVER in the area of Asheville, NC and are looking for a home away from home, you have it at Bed and Breakfast at Tiffany Hill. Thank you, Selena, for your most WONDERFUL hospitality. We used a Living Social voucher for our 3-night stay at the bed and breakfast and couldn't have been happier! Not only was it a great deal, but the accommodations, service, and scenery far exceeded our expectations. Our room was beautiful and very romantic with views of the rolling hills and mountains in the distance. Selena, the owner, was wonderful and so welcoming. Kate made us incredible breakfasts each morning and was full of great advice on where to find things to do in the area. We couldn't have picked a nicer place to stay while visiting Asheville and will most certainly return the next time we're staying in the area. To anyone who has not yet tried this B&B, I would wholeheartedly recommend doing so! This is the most beautiful, tranquil, and exceptional Bed and Breakfast that we have ever visited. Selena is an extraordinary innkeeper; every amenity that one could possibly imagine is found here. You are greeted at the front door of this magnificant place and become a friend, immediately. This is our favorite B & B. I rate this as 5 stars in every category. Selena is authentic, and the love she has for beauty and for people are felt here. Tiffany Hill was definitely a perfect answer to my prayers. I recently stayed there and used the B&B as the site to propose to my fiance. The owner and the other staff there were completely and totally devoted and willing to make this experience one of the best of our lives. The passion for serving others is evident in everything they do. Tiffany Hill does a magnificent job of making each guest feel like family. I highly recommend this B&B to anyone seeking a relaxing get away in a warm, comfortable environment. What a great weekend! This was our first time in a Bed & Breakfast and we hit the jackpot! We went with friends and family, so I was able to see all the rooms. They are all charming with their own unique qualities. Tiffany Hill is modern, clean and has wonderful food. Selena is such a fun and gracious hostess/inn keeper. Tiffany Hill has wonderful outdoor spaces and is the perfect quite getaway. 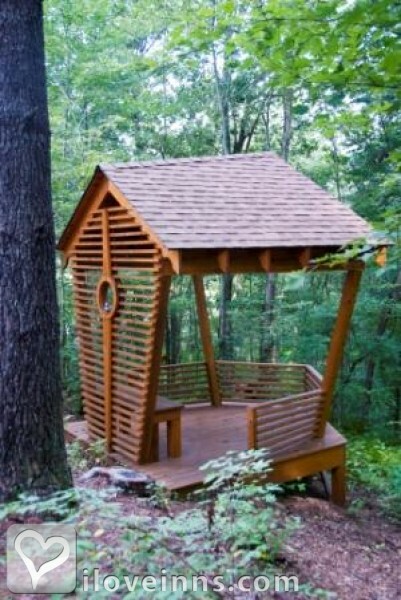 My favorite spot was the Human Birdhouse. If you can force yourself to leave the property, Tiffany Hill is in the middle of it all. Close to Asheville, Biltmore, qaint shops in Hendersonville and Brevard, Pisgah Nat'l Forest and the Blue Ridge Parkway. We all had a great time and can't wait to go back! We love, love , love this B & B. It was the most fantastic place! We felt right at home and did not want to leave. Selena and Kate made us feel like family. We loved the comfort, the food, the snacks and the atmosphere! We will definitely be returning to this wonderful B & B. Fred & Reaynea Spring Hill, FL. Everything about the B&B on Tiffany Hill is outstanding. From the moment you walk in the door you are made to feel so comfortable that it feels like home. Our room was fabulous and the bed and bedding so wonderful that I didn't want to get up in the morning. However, the 3-course breakfast is so tasty that you can't wait to get ready to eat. Kate and Salena felt like family and when it was time to leave I realized how much I would miss them. I have already booked my stay for next year. Do as little or as much as you like...Selena has captured this at Tiffany Hill! What a beautiful place to stay. The personal touch from Selena is topped by none. Breakfast was AMAZING, the most comfortable stay ever!!!! Want to return! You'll love it! Just completed a fantastic 3 night stay in the Charlottesville Suite at the Bed & Breakfast on Tiffany Hill. From the time we were welcomed as we entered the front door until Selena, innkeeper/owner, standing on the front lawn, waved goodbye to us as we left for home it was apparent she genuinely loves what she does! The statuesque Bed & Breakfast on Tiffany Hill is perfectly positioned high atop a hill with a magnificent view overlooking scenic farm land, rolling hills and distant mountains. The beautifully appointed decor, immaculate grounds, luxurious seven layer bedding, a scrumptious gourmet three course "Breakfast at Tiffanys" (which, by the way, includes dessert!) sets the bar high for comparison. Selena is a gracious hostess who makes you feel right at home in her lovely bed and breakfast; the fulfillment of her dream for over 25 years. Her personal touches make Tiffany Hill the epitome of beauty and hospitality. With its close proximity to downtown Asheville, the Biltmore Estate, Brevard and Hendersonville we enjoyed a variety of activities plus dined at some of the finest restaurants the area has to offer. Our stay could not have been more perfect. First class all the way. We'll definitely be back to make more friends and memories at the Bed & Breakfast on Tiffany Hill! I had been hinting for over a year to my Husband about bringing me to the B&B on Tiffany Hill! Which I had discovered through a friend on Facebook and had been following every update on Facebook, since. We took a road trip from Texas to come visit. We were not disappointed! I give it 5 stars!! The experience was better than I had imagined. Selena is a doll and so hospitable and so informative! We were so happy that she suggested places for us to go see. But beyond experiencing the beauty of part of NC, I would have been happy just staying at the B&B and taking in all the beauty there, inside and out. I love the decor and cleanliness of every room. And Selena has thought of everything from bird watching to reading to providing quite a few beverages to drink. She is so organized and thought of every little detail, you'll open a drawer and find what you are looking for. My husband and I are coffee drinkers and she has provided an area both upstairs (where our room was) and downstairs for our convenience. Then breakfast was awesome and her staff member was so pleasant and accommodating. We had breakfast with one other couple and it was so nice visiting with them. Then Selena came to visit and make us feel so welcome. She is such a delight! I can not wait to go back! I told her that I would love to have a girlfriends weekend there!! She said she has had that there before. She told me how easy it was for a lady that had done it, to organize it. She said that the lady reserved 5 rooms and she invited 5 friends, and had four of the friends invite a friend to stay in a room with them. And they split the cost of their room...My husband brought me for my birthday which fell on Easter Sunday. Selena had a birthday card and cookies waiting in my room for me when we arrived the day before. Then the morning of, she brought out a piece of dessert with a lit candle and sung me "Happy Birthday". I just turned 47 and this was one of my best Birthdays ever! I definitely want to go back for my 50th but I don't think I can wait that long!! I want to say, "Thank you Selena! And God Bless You!! I know He already has and thank you for passing on the blessings!! I pray that He continues to bless you in everything that you do ~"
Our stay was everything we hoped and dreamed for. It was truly worth the drive from Florida to get away to. From the welcome at the front door by the innkeeper, beautiful room overlooking the pastures to relaxing on the porches birdwatching and enjoying the beautiful scenery around, relaxing night's sleep, wake up to 3 course breakfast that was absolutely delicious, gathering around the table to get acquainted and become friends that seem like family, to when it was time to leave it is not a "good-bye" but "till we meet again". We are so thankful we could share the journey of Selena's "Dream come True". She loves what she does and shares her dream with others. Everything about our experience at Tiffany Hill was wonderful! The facility was clean and well maintained. The food was delicious and served graciously. Selena could not have been a more friendly, accommodating hostess. Every day started with a positive message, travel suggestions and assistance for the daily adventures, and the promise of a restful evening. I booked this bed and breakfast based on reviews I read online, and I was EXTREMELY pleased with our stay. The Inn is beautiful, the grounds are immaculate, the beds were SO comfortable, the amenities were over the top, and the innkeeper is FABULOUS! I can not speak HIGHLY enough about the Bed and Breakfast on Tiffany Hill. I am looking forward to another visit....SOON!!! Absolutely love B&B on Tiffany Hill. We have been twice already and have already booked 2 more visits. It is a great place, super clean and the owner, Selena, is a real pleasure. HIGHLY Recommend!!! A Real Breakfast at Tiffany's! It was by accident that we found Tiffany Hill and it certainly was a happy accident. I always felt that one could rate a bed and breakfast by the quality of its linen and its breakfasts and this one did not disappoint. Tiffany Hill was constructed to be a B&B so Selena made sure that what she has learned to like and dislike in her travels were what she incorporated in the design. For example, the inn has two staircases to ensure that there is enough separation between rooms and allow for privacy for guests. Security is paramount so the interior and exterior doors all operate by keyless entries. 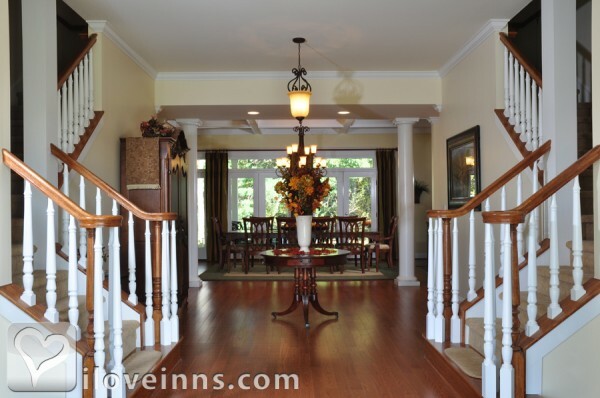 As you enter the foyer, one can�t help but notice how well appointed the facility is. Not only does the inn have a small library where you can pick out a book to read, but a collection of DVD�s you can watch in your room and a wide selection of games. There is a sitting room with a big picture window overlooking her herb garden where you can sit and curl up with a book. Near the foyer also is a little gift shop where guests can purchase some of the linen and toiletries found in the inn, as well as souvenir coffee mugs, t-shirts and coffee table books. The kitchen is modern and spotless and the adjacent dining room sits 10 with another round table that seats 4. The breakfasts were impressive � hot, prompt, homemade with natural ingredients from her garden, a full course meal of fruit to start, baked hash browns in little ramekins, eggs, smoked sausages served on her finest china. And breakfast always concludes with some decadent, indulgent and sinful dessert. After all, one is here to rest and enjoy life�s little pleasures. One can�t help but feel really pampered with the opulence of chargers and flutes to drink your orange or apple juice or V8 from. On the soffit is displayed the famous photograph of Audrey Hepburn, to just bring home the point that you are indeed having breakfast at Tiffany�s. We picked the Charlottesville room for our first visit to this inn. A four-poster king bed greets you, massive and inviting with plump pillows and shams. 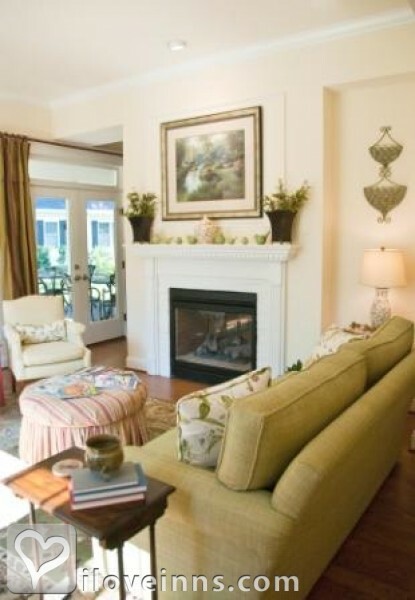 A sitting area fronting a gas fireplace has two comfortable wing chairs and blankets for the colder nights. Piped in soothing music fills the room but if you�d rather have quiet, all you have to do is turn the dial off and revel in the serenity of the place. A glass top desk is available for writing and for those that couldn�t live without their laptop, the inn provides a very strong and complimentary wi-fi connection. The room is tastefully furnished with ambient lighting from windows covered with honeycomb blinds. No detail is overlooked � I am impressed with the fact that even the electric cords were wrapped in fabric. Of course the linen is the most sumptuous of all, the smoothest silkiest sheets ever. On our second night, my husband had mentioned that we had double flat sheets underneath the matelasse coverlet! Trust Selena not to skimp on anything. The bathroom was a sanctuary in and of itself with a shower and a jetted tub. I did not want to leave that tub but alas I was already wrinkled as a prune from soaking in it with the aromatic bath salts she provided. Towels were thick and heavy, as were the luxurious spa robes in the closet. In keeping with her fastidious attention to detail, the bathroom had a chandelier that was controlled by a dimmer so that the bright light doesn�t disturb anyone sleeping in the room. As if that wasn�t enough, there was a kind little nightlight near the sink to provide even more ambient lighting. I usually bring my own blow dryer when I travel, but she has provided one very powerful one with a cold shot button. How amazing is that! I guess only someone like me who looks for a cold shot button on a hair drier to set those curls properly can appreciate this attention to the smallest of things. Each sink area was provided with a black washcloth to remove makeup with a container of Q-tips and cotton balls adding to the pleasant surprise. Nothing was overlooked. 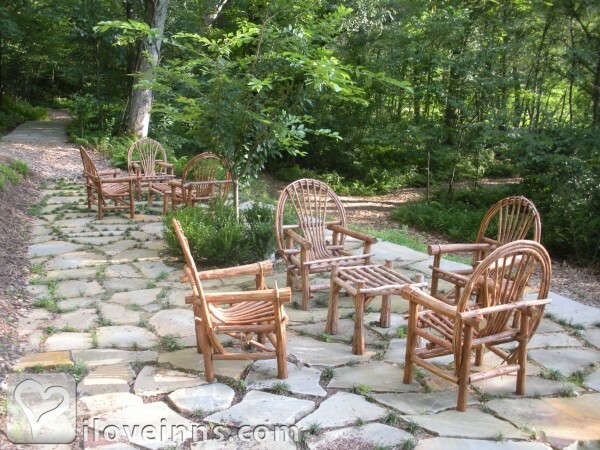 Outside the inn is a porch with rocking chairs and more chairs in a patio at the back facing her garden. The inn also boasts of a bird house, a gazebo-like structure with curtains on three sides. Built to be a bird watching station, many of her customers choose to have their massages out here to be one with nature. And for those who prefer to be more solitary, there is a hammock underneath the trees to take a nap in while taking in the summer breeze. A little off ways from the parking area of the property are several Adirondack chairs where one can sit and chat with a group. My husband chuckled as he saw the stiff brushes hanging by the side of the chairs. Trust Selena to provide her guests with something to brush leaves and dirt from the chairs before they sat down, one more thing that she never overlooks. Of course, one cannot finish this review without writing about the innkeeper herself. Always welcoming and concerned about her guests' comforts, she was always present to answer your questions on best places to eat, shop, hike or anything else that suits one�s fancy. As we pulled out of her driveway this morning, she stepped near the edge of the property, waved a big wave and blew us a kiss. Tiffany Hill was a home away from home and the experience raised the bar for us on bed and breakfasts. This one is definitely on our return list. Brevard, Hendersonville and Asheville has a lot to offer. Selena and Tiffany Hill makes it easy to come back. From head to toe, every need is anticipated. Stayed in the Lexington Suite which is the ultimate in luxury. This is the second time our group has rented the whole inn. We have a waiting list for next time. Just sublime! My husband and I just returned from celebrating our 15th anniversary in the Asheville/Brevard area. The Inn at Tiffany Hill was definitely a highlight of the trip. From the moment that Selena greeted us at the door, we were welcomed and made to feel quite at home. The Inn is immaculate and the service is amazing. We had only stayed in older, renovated B&Bs before - but I preferred Tiffany Hill to all of the other ones we had been to. The breakfast was incredible! We left Tiffany Hill feeling relaxed and rejuvenated! Thank you, Selena. I just visited the Inn for 5 nights with 11 college friends. We booked the main house taking all 5 rooms. We enjoyed sitting on the front porch rocking chairs and back porch with gorgeous views. It was fun catching up and relaxing, Location is great... 10 minutes from airport and Sierra Nevada Brewery (a WOW); 30 minutes from Asheville and the Biltmore Estate. Easy to get around which makes a big difference. The Inn is meticulously cared for and the property is gorgeous. The piped in music is fabulous and breakfasts are special. Selena and her staff go out of their way to be sure you have what you need. I will return to the Inn for more fun times and exploring the wonderful area.,. We truly loved our stay at the Bed & Breakfast on Tiffany Hill. It had been highly recommended to us by good friends of ours, and we are so glad we gave it a try! 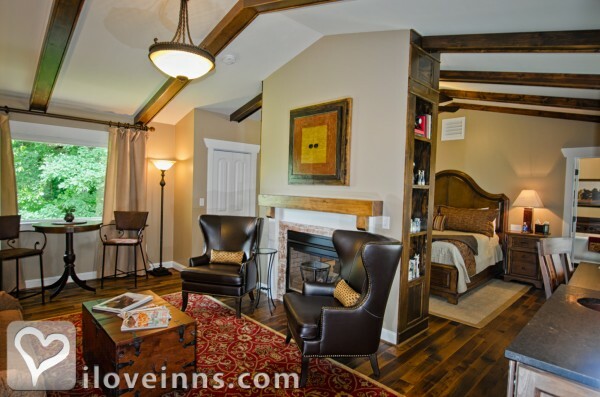 The inn is simply lovely and inviting, the rooms are impeccable, and the service is unsurpassed. The owner/innkeeper is a very warm, yet highly energetic lady who has seen to every detail to make her guests comfortable and feel at home. Her motto is, "come as a guest, leave as a friend," and that is truly how her guests are being treated. The inn has an excellent location half-way between Asheville and charming Brevard, and it is situated on a knoll with a beautiful view. We are already looking forward to our next stay at this hidden secret. "Every day we celebrate something at Tiffany Hill" is a common greeting from Selena (Owner/Proprietor & friend to all guests). My wife and I have enjoyed many trips and celebrations at Tiffany Hill; wedding anniversaries, retirement, birthdays and just getting away to enjoy the mountains and atmosphere provided by Tiffany Hill. The setting is peaceful. The Inn is beautiful, pristine and each room is carefully designed and decorated to make every stay a special event. The breakfast is a wonderful three course meal to start the day allowing you to do as much or little as you desire. We gladly give our highest recommendation!!! !